Design Process Blog: Kinetic Type: Initial action story boards. These are my 3 story boards that show my transitions from one action to the next. 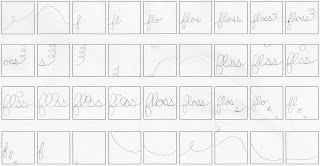 Since I'm using the noun floss, I decided to make my typeface a thin cursive like string of letters that resemble floss. 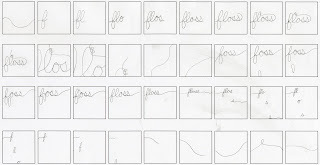 Im sticking with my idea of being instructional and Im using my actions of twirl, wedge, and remove to show just how the floss works while practicing hygiene. The floss is first twirled around your fingers, then wedged in between teeth, and then used to remove particles from in between your teeth. 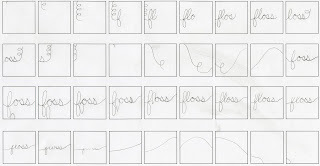 So My actions will narrate a story of beginning to end, the action process of flossing your teeth!